The job description was right in his title – Senior Vice President of Business Development. His goal was to make sure his company, Franco-Nevada (FNV), succeeded in raising enough money to return to the public markets. Paul, who's now the company's president and chief financial officer, hit the road with the rest of Franco-Nevada's top brass to get the word out. They started in Paris, because Franco-Nevada historically had a lot of French investors. The first item on the agenda was a lunch meeting at the Paris Ritz-Carlton. Paul was ready to impress. "I had my pitch books ready," he later explained. Unfortunately for Paul, he never got his chance with those pitch books. The problem was Pierre Lassonde, the CEO of "old" Franco-Nevada and the current chairman of the board. As Paul tells it, "Pierre was saying hello to everybody, kissing everyone on the cheek. It was like an old family reunion." They sat down and had lunch. Toward the end of the meal, Paul was ready to jump into action. This was his time to shine. He had his slides queued up and was ready to give his pitch. "I just want to let you know we're back. And I hope you'll invest with us again." After that, they left. Lunch was over. Paul couldn't believe it. He didn't even get to his pitch. He wasn't able to do his job... convincing folks why they should invest. But then, something strange happened. Their investment banker received a call as they drove to their next meeting. They had received their first order for $300 million. That's when Paul realized that in the gold industry, track record is more important than anything. Pierre Lassonde has one of the most impressive track records in the industry. And all it took was that track record (and few kisses on the cheek) to score a deal worth several hundred million dollars. His most impressive win was the original Franco-Nevada... Launched in 1983 at a $2 million valuation, the company sold for $2.5 billion in 2002. That's an unbelievable annualized return of 46% per year for nearly two decades... a total return of more than 120,000%. Anyone who got in early enjoyed one of the most profitable investment rides in history. Paul and Pierre took the company public again in 2007. And it has continued to thrive ever since. I tell you this today because gold has secretly become one of the best opportunities of 2019. It's now firmly heading higher. And that means high-quality gold companies like Franco-Nevada are now fantastic opportunities. One of the best ways to make incredible profits as an investor is to own high-quality gold companies when the metal is trending higher. 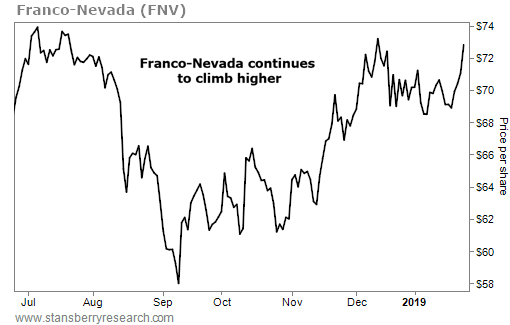 Gold is trending higher today... And Franco-Nevada has been soaring as a result. This is a trend I expect to continue this year. Gold tends to thrive when investors are scared. And folks are darn scared today. That's why I recommend owning gold right now. And if you're looking for a quality gold business to own, Franco-Nevada is as good as they come. "This forgotten corner of the market is setting up to be a major winner in 2019," Steve says. Read more about another precious metal in a quiet uptrend here: A 'Silent Boom' Is Starting Outside the Stock Market. "I love to see this setup," Steve writes. "It's the kind of sentiment extreme that contrarian investors dream of." Learn more about what he looks for before putting money to work – and another potential way to take advantage of the recent move in gold – right here.